Here is the RAK DVD for artists of all ages and ability. Learn basic skills specific to comic book illustration from one of the most versatile artists ever to work in the field. This one has it all - How to develop believable characters, how to write their stories and then how to lay out and place them into their own comic book. Based on his sold out classes and seminars, this DVD contains timely and timeless advice and guidance to help you achieve your comic book/fantasy/sci fi illustration goals!! Over 2 solid hours of instruction from an artist who has been there and done that. As one of the pioneers in the independant publishing industry, as someone who has worked with the top video game and toy companies in the country, RAK gives you the real deal in this awesome DVD. 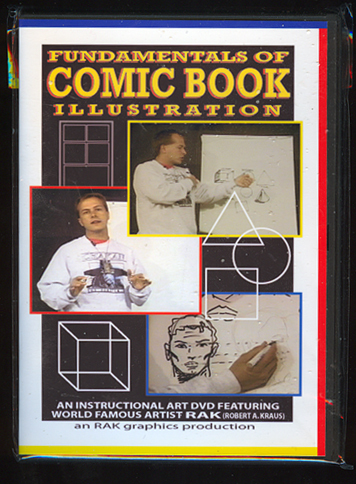 Get your FUNDAMENTALS OF COMIC BOOK ILLUSTRATION DVD today!! !